This week's chats, and Girlfriends Cyber Circuit presents Amanda Ashby! Hey, it's almost summertime! Which means it's time for me to estivate (hibernation for summer--look it up, I swear I didn't invent it) and dive into revisions for Shine. But first I have two chats coming up this week at Eve's Fan Garden. Monday night at 8:30pm eastern time, the topic will be Fun in Writing, and the topic Wednesday night (also at 8:30pm) will be Romance in YA. Should be lots of fun! But enough summer talk. For today's Girlfriends Cyber Circuit guest, it's almost winter. 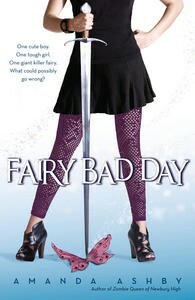 One of my favorite Twitter buds, Amanda Ashby, has a new book out: Fairy Bad Day! How much do you love that cover? "If Buffy and Harry Potter got together and threw a magical slayer party, it would be the world Amanda Ashby created in Fairy Bad Day." -- Tera Lynn Childs, award-winning author of Oh. My. Gods. and Forgive My Fins. Follow Amanda on Twitter--I do! All of it. 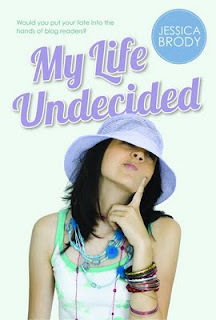 Considering I write light-hearted books, this one was a lot of hard work. It was revised numerous times as my editor/agent and I tried to find the ‘real’ story. Even though it stayed the same in essence, it just seemed to take forever to get finished and by the time it was done my critique partners and I were heartily sick of it. Thankfully, it’s been fully edited for about eighteen months now and I have a very bad memory, which makes it possible to now look on it fondly without remembering the drama!!!!! My husband and I only started watching Deadwood last year, well after it had finished as a series and we were just staggered at how amazingly perfect it was. Especially if you’re writer—it’s like taking a master class in characterization and it just left us in total awe (though for awhile it was impossible to stop swearing Deadwood-style!!!). 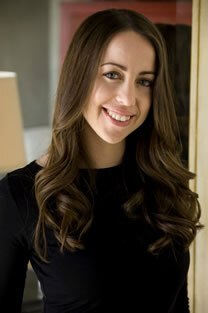 And even cooler is the fact that Trixie is going to be playing Katniss’s mom!!!! Honestly, there isn’t anything special. It probably helps that we have moved country SO many times over the last fifteen years that we’ve become quite zen about owning things. I’m not saying that it stops us from owning things (with particular reference to retro handbags) but I don’t get attached to things the same that I probably did when I was younger. Well, I can do all of the above things and nothing normal springs to mind that I can’t do, though there is one dumb thing that I absolutely cannot/willnot/don’ttrytomakeme and that’s clapping my hands in time to music. It literally makes my skin crawl, which my husband—who is the most amazing guitarist ever—finds totally weird since he thinks in music. In fact it literally took me about five years to figure out when to clap on the Friends song! No, I’m wildly untalented. Unless of course you count sitting and watching TV for hours on end, then in that case, I rule!!! In fact I always need to fan myself down when people try and tell me how boring they would find it if they just had to stay home all day. Because to me, having all day to read and all night to watch TV would be bliss! Well, I’m a HUGE Jonathan Stroud fan (and for anyone who hasn’t read his Bartameus, then you really, really must because he is amazing). Anyway, when he joined twitter I kept telling other people to follow him and for some reason he decided to send me a tweet to say thank you! I kid you not I literally ran around the house for ten minutes being very undignified!!!!! And the main lesson we can learn from this is that for one little tweet, I’m your friend for life!!!! I often dream that I steal the blankets off my husband, though apparently this is true so I guess it doesn’t count!!!! I switched to Google Chrome. Like a dream--a dream, I tell you! This could be the beginning of a beautiful blogger-browser relationship. Congrats to Amanda on her new release, and good luck with her move to Australia! Happy winter! Hey, out of nowhere, the first of two release days for me this week! If you're a fan of PC Cast and Kristin Cast's House of Night YA vampire series like I am, you don't want to miss this gorgeous new anthology of essays exploring aspects of the series. 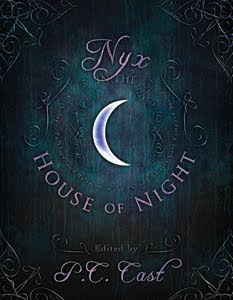 Nyx in the House of Night: Mythology, Folklore, and Religion in the P.C. Cast and Kristin Cast Vampyre Series is a collection of writings by paranormal authors and experts in the field. It's full of fascinating discussions that shed light on the series' complex world-building, plus some beautiful illustrations. My own essay touches on Kalona and his similarities to another fallen immortal I have some experience with (fictionally, I mean)--Lucifer himself. I signed copies of Nyx in the House of Night at BookExpo a couple weeks ago, along with fellow YA authors Jana Oliver and Trinity Faegen. I also snagged a triple-signed copy just for you. See below for how to win. Find out more at SmartPop's Nyx page. If you were any character in the House of Night series, which would you be? Deadline: June 10, 11:59pm eastern daylight time. Winner will be announced in the comments to this post, so subscribe to the comments if you want to be notified without leaving your e-mail address (which I do not recommend, due to risk of spam), or check back here on Monday. 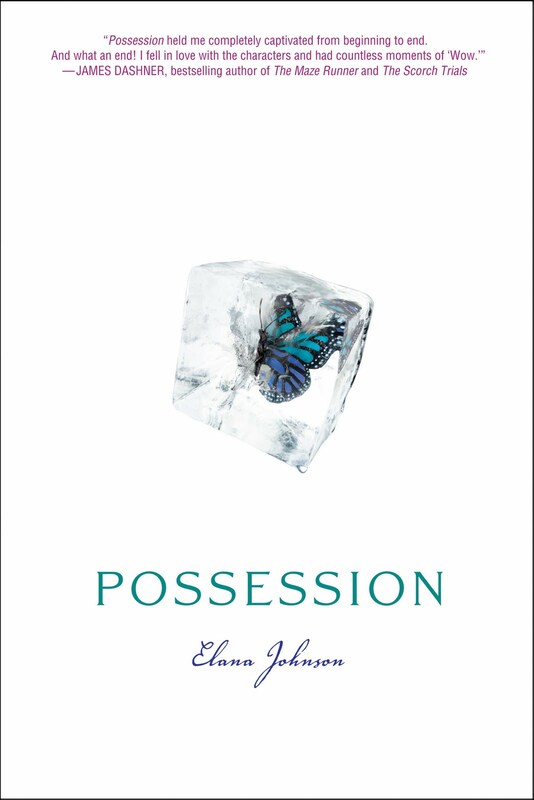 By now many of you have seen or heard of the “article” in the Wall Street Journal, “Darkness Too Visible,” about alleged “depravity” in young adult fiction. If you haven’t, go read it, and I welcome your comments about it here on the blog (especially since that site is having trouble accepting comments). Like many authors and readers, I was outraged and saddened by the article, and by the cheerleading section in its comments. What I was not, however, was surprised. It’s no accident that this opinion piece masquerading as journalism appeared in the Wall Street Journal, as opposed to any other newspaper. The Journal’s news reporting used to be top-notch. They’ve won thirty-three Pulitzer Prizes, the last one in 2007, a gold medal award-winning story about executive stock fraud. All the while, their editorial page had a strong conservative slant—they were, after all, the paper of record for the business world, whose primary goal is profit. In 2007, the Wall Street Journal was bought by Dow Jones & Company, a subsidiary of News Corporation, the same communications conglomerate that owns Fox News Channel. Many of the Journal's serious journalists and editors have since flocked to other news organizations, frustrated with the paper's new lack of interest in thorough, investigative journalism. The people who run Fox News--and now the Wall Street Journal--want you to believe that America is engaged in a "Culture War," that the country is divided by moral issues such as gay rights, affirmative action, abortion, and feminism. We are not one American people united by belief in freedom and equality and our love for baseball and apple pie--no, we are at WAR with each other, dammit, and everyone must take sides. Really, Pat? Gay rights are as dangerous as Soviet nukes? Really? Sadly, these days, more people than ever subscribe to this fear-based world view, thanks to Fox News and right-wing talk radio hosts like Rush Limbaugh and his many wanna-bes. Every year, Fox host Bill O'Reilly yells about the "War on Christmas"--a manufactured controversy if there ever was one. Well, normally I stay quiet about political issues online (as quiet as I can). If I commented on every issue that bothered me, I'd never get any books written. But now, the right wing has waded into my territory. They're accusing me and my friends and our publishers of "us[ing] the vehicle of fundamental free-expression principles to try to bulldoze coarseness or misery into their children's lives." When you start waving code words like "depravity" in my direction? I speak out. Lots of other authors and readers have spoken from the heart, in a non-political way, about how YA novels have changed and even saved their lives and how they provide a way for teens to deal with the darkness within and without. How many of them literally wouldn't be in this world if it weren't for books. It's all true, and I totally agree. But I don't feel the need to repeat what others have said so eloquently. Everyone comes at these things from different angles. Mine is political, because it's what I know. The root of these freakouts is fear. Fear of the Other, whether the Other be a different race or sexual orientation or religion or mental health status. Fear that their children will grow up without that same fear. I try real hard, but I don't understand that impulse. My parents weren't liberal by any stretch of the imagination, but they encouraged me to read anything and everything, even if it led me to see things differently than they did. They weren't afraid of the world that books could show me. Not every kid is as lucky as I was. If we, as storytellers, can lay a path through the darkness, we owe today's teens nothing less. SEVERE AWESOME WARNING: A high pressure system is moving into the region, bringing sunny days, starry nights, and unseasonably comfortable temperatures. SEEK LACK OF SHELTER IMMEDIATELY! Anyway, I turned in Shine, so while I'm awaiting revisions from my editor I'll be polishing up the free WVMP serial novella beginning here on July 26 (Mick Jagger's birthday, how perfect is that?) and writing up a few ideas for my first post-SHADE trilogy YA novel, which will be out Fall 2013. But first! Today on the blog I have one of my favorite YA authors, Elizabeth Scott, whose latest novel, Between Here and Forever, has put her on my very exclusive "auto-buy" list (I haven't counted, but there are probably fewer than ten authors on that list). I read Between Here and Forever last week after getting back from BEA. Being on deadline, I thought, oh, I'll just read a few chapters so I can get an idea of what it's like before I post her interview. Then two hours later it was, well, I'll just get to the halfway point. An hour later, it was, I'll read until I have fifty pages left so I have something to look forward to tomorrow. A half hour later, I was finished. I did not get up from the couch the entire time. Me reading a book in one sitting? Never happens. But it did. I was utterly drawn into orbit around these characters. The thing I love about Scott's creations is that their choices always come from who they are, and I never get the sense that there's a puppet-master author pulling their strings. Not that I don't also enjoy puppet-master books--it's fun sometimes to notice the strings and go, oh cool, that was an impressive little maneuver. But with Scott's books I'm always completely immersed, completely invested, completely believing, until I pop out of the world at the end of the book and only then truly realize that I've been somewhere else. Does that make sense? At all? 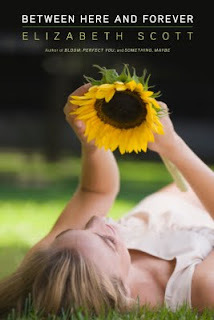 Between Here and Forever has gotten lots of great reviews. I particularly liked this one from Booklist: "[A]n emotionally wrenching exploration of hope, acceptance, and pride, and Scott's messages--that it's quite possible to break your own heart and that everyone deserves love--will resonate strongly with teens navigating their own first romances." Q: Which moment(s) during the writing/rewriting/editing of BETWEEN HERE AND FOREVER made you tear your hair out? A: On the fourth draft, I cut a lot of stuff out that just killed me to do, but it had to be done. Q: Which moment(s) made you think, "ah, THIS is what carries me through the hair-tearing bits"? Q: We're told we have to "kill our darlings" when we edit. Can you share a deleted line or paragraph you would've loved to have kept? Bonus question: tell us why you decided to cut it. A: I cut a lot of stuff from my novels--on average, about 40%. And at this point, I really don't want to go back and look at old drafts, so I can't tell you something I cut, but I can tell you I cut it because as much as I loved it, it wasn't right for the book. Q: If your house was on fire, what object (not including living creatures, human or non-human) would you grab on the way out? A: As many books as possible! Q: Is there anything most people are able to do (such as drive a car, swim, ride a bike) that you can't? A: I can't do a cartwheel. No, seriously, I can't. Me neither! Even when I was a kid, I couldn't do a cartwheel. I blame gravity. 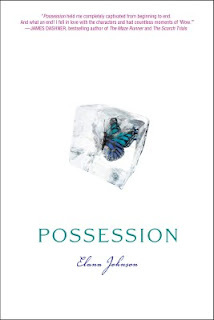 Congrats again to Elizabeth on the release of another poignant, delicious read!